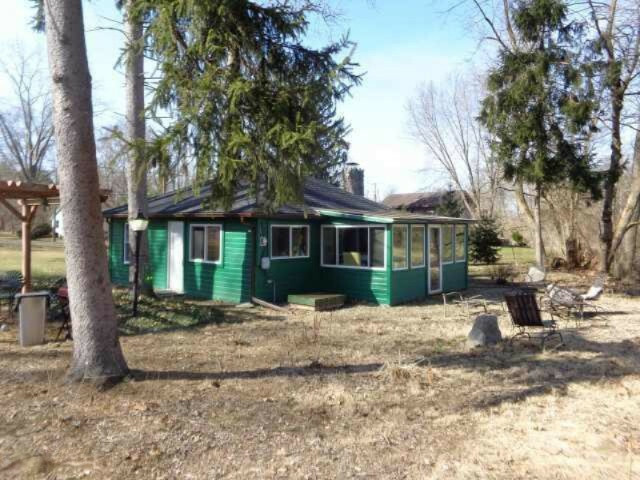 Private wooded get a way on nearly 1 acre just outside of town at quiet edge of Dowagiac creek. This perfect wildlife & bird sanctuary is neatly tucked back, just off the road , and has had total professional remodeling of entire home , garage & property including ; all new roof, gutters /downspouts, windows, interior & exterior doors, sheet rock, flooring, all new kitchen & bath with beautiful ceramic tile , 200 amp electric, baseboard trim, patio area, and pergola. Original floor to ceiling beautiful field stone masonry fireplace in family room. Awesome 4 seasons room with large 3 wall glass views overlooking creek/water views, appear to be scenes from the upper peninsula... .great fishing awaits you right outside your back door.The fire pit on new north side patio that appear to be from the upper peninsula. Great fishing awaits you right at your back door. A panorama of stars is revealed at night, great place to relax & unwind in our warmer months. Has been used as a weekend getaway, but it's a year round 2 bed, 1 bath home & offers a lot in a smaller living space with unlimited room to expand if desired. Home to be sold fully furnished including all newer appliances & big screen TV. Garage has attached tool shed. Garage and house were painted 2 years ago. Property has both a circular and straight, pull-in driveway. Taxes would be significantly less if owner occupied. Seller is providing a one year buyer protection warranty. Property features flourishing mature perennial gardens, highlighted by an extensive collection of wonderful ornamental grasses, including Pampas, Morning Light, Shenandoah Switchgrass, Japanese Silver Grass, Maiden Grass 'Adagio', Karl Foerster Reed Grass, Zebra Grass and more. Property is edged on the East by Michigan White Pine and Colorado Spruce and Fat Albert trees, and on the West by Northern Pines. The main driveway welcomes you with gorgeous flanking Austrian Pines. All trees purchased by owner from and planted by Sawyer Gardens. Also included are an extensive assortment of gardening tools.